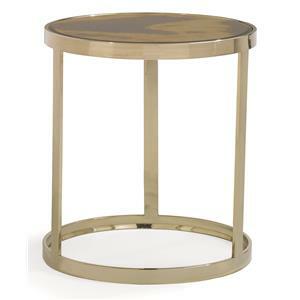 This attractive end table is all out modern. It features a beautiful stainless steel base with an Italian mirror top that gives you the luxury of mirrors with a more artistic look. 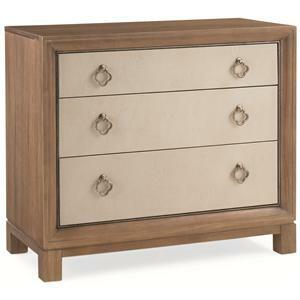 This piece is crafted by a high end manufacturer who offers great quality and style. Both the "Glam-More" and "Much to My Shagreen" nightstands pair a stunning wood veneer wrapped case with bleached, untanned animal hide for a rich two tone, dual texture look. "Glam-More" is the traditionalist of the two, offering a rich Mink finish and real goatskin drawer faces, while "Much to My Shagreen" offers a lighter Cerused Walnut finish with faux shagreen and playfully cast, clover-shaped metal hardware. 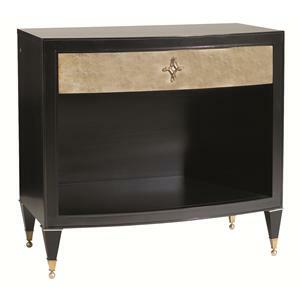 The uniquely shaped "You're Dreamy" chest will give your bedroom some additional storage, as well as some glamorous style. The top and bottom drawers are cantilevered to add some intriguing depth, while the acrylic tapered legs provide a light counterpoint to the Champagne Shimmer finish on the Koto wood. Access the four spacious drawers via the Whisper of Gold finished metal handle hardware and be amazed by their soft-close mechanism. 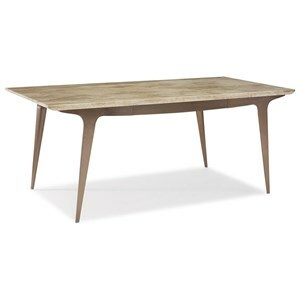 We're calling "A Milestone" a desk, but it could easily be used as a stylish dining room table as well. The piece features a gorgeous stone top supported by Dark Bronze finished metal base, creating a combination that is sophisticated and contemporary. 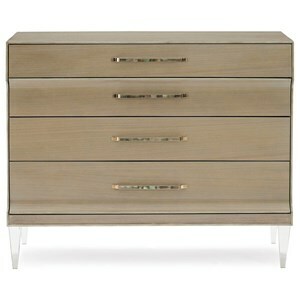 Furthermore, it features a single drawer for some convenient storage for your silverware or writing utensils. A classic oval back and cabriole foreleg gives the "Curve Appeal" arm chair traditionalist, throwback charm, while its satin sheen, ivory hue brings the style up to date to pair with contemporary dining interiors. 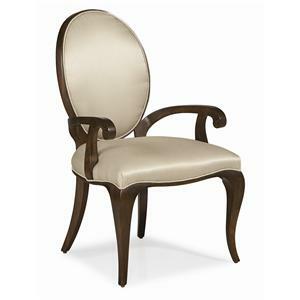 The hardwood frame features a Mink and Panache blended finish that helps define the lovely curves of the chair design. Elegant glamour at its most artistic! 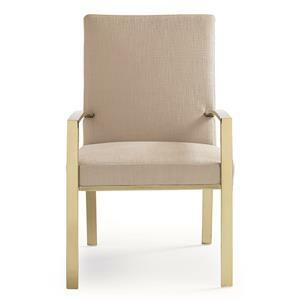 This modern dining room chair is crafted with a stainless steel base that is finished in Gold Bullion for a stunning composition. The seat and back are padded for comfort. Turn the chair around and you'll notice the intricate metal design that supports the back. The artistic style has a look of cracked ice, helping give this chair its artistic name. This chair pairs well with the "Do A 360" table from this collection. Sis-Boom-Bah is no cheerleader, but it's just what you need to give your room a little pep. 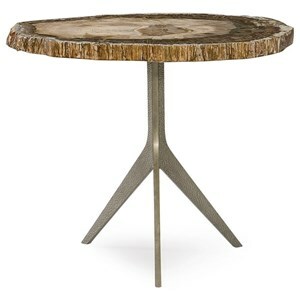 This dynamic statement table embraces imperfection with a natural petrified wood top. It's genuine fossilized wood, so the shape of the table and the tree ring pattern are unique to each piece. The table base is cast iron in a dark bronze coloration. Choose the Sis-Boom-Bah Table to add an edgy touch of modern rustic to your living room decor. 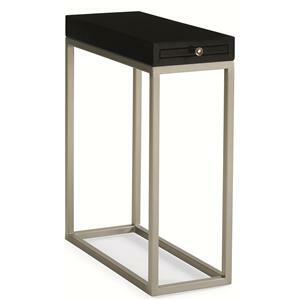 At only 9-inches wide and 21-inches deep, this dynamic accent table can go just about anywhere. A black-and-white geometric patterned pull-out shelf with a small, round mirror inlay at its center looks great extended, and also provides a convenient and ideal spot for your setting your favorite beverage while you recline. The table base is made from metal and finished in Brushed Silver. 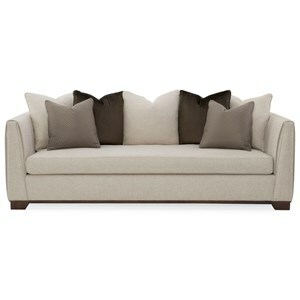 The Moderne sofa delights the eye with a sleek silhouette and elongating channel stitching. The channel stitching extends around the arm to the back, making this sofa an exceptional piece to "float" in the middle of your room. The crisp modern style looks impeccably elegant, and boasts a color palette of earth tones and creamy neutrals. This sofa is a superb space for lounging with its nest of feather down pillows and a down-wrapped seat cushion. This is classic contemporary design at its finest. Welcome to a new experience in high style, high value furnishings! Caracole is a portfolio of unique items that work in harmony to furnish your entire house. Every piece represents high design and independent thinking, with more than fifty finishes and materials: exotic woods, mixed elements and hand-applied finishes. Each piece stands alone...and speaks for itself. For example, a closed storage item might say "bedroom dresser" to you while serving as a "dining room sideboard" for your neighbor. It's OK! So, as you browse through the three distinct and carefully edited portfolios; throw the rules out the window and allow your subliminal preferences and unconditioned reflexes to make the call. And above all, have fun utilizing Caracole's fresh originality to make your home...YOUR home.